In all the time I’ve been dealing with riders working their way up the track riding ranks I’d say that resistance to leaning the bike has got to be the most common roadblock I see. This typically comes from riders who are working to perform correct technique, but they reach a point where leaning the bike any more becomes difficult. Fear of leaning the bike can come from a few different places. In this article I wanted to go over many of those places, along with some steps you can take to help overcome this fear. First, we’re going to tackle the more common mental barriers that riders have around lean angle. After that we’ll look at some practical steps to take. 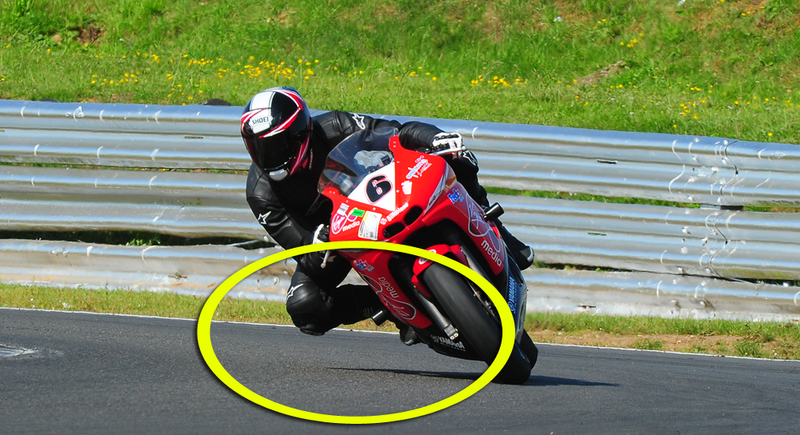 This is the simple fear that the bike and tyres won’t be able to handle higher lean angles, they’ll lose traction and you’ll crash. This leaves them riding at a lean angle they know to be safe and they find it difficult to push past that current limit. The first thing to do here is to try and understand just what your bike and tyres are really capable of. For the vast majority of you reading this, your tyres are likely a lot more capable that you realise. The image below is one of my favourite photos I like to reference when this fear comes up. This picture was taking at the launch event of the old Dunlop Roadsmart II back in 2011. As you can see lean angle in particular is not a problem for this rider. And this wasn’t even a road biased track tyre, it was a sports touring tyre. And that’s an important distinction to make. With a balanced bike and smooth rider inputs, lean angle itself is not the limiting factor of tyres like these. The limits of these kinds of tyres are found when trying to push the front going into corners, and as you’re trying to lay down the power as you’re coming out of them. Even many riding schools use sports touring tyres on their bikes because they know they’ll offer enough grip for the students to ride comfortably, but they’ll last a few thousand miles more. Another way to gain perspective is to look at what others are doing around you on similar machinery and tyres. One of my biggest boosts in confidence in my earlier years came from watching my friends go racing. I was riding the next day at the same track, and seeing the guys blasting around a healthy amount faster than me injected belief into me overnight. Knowing I could fall back on the fact that I was performing good technique, it enabled me to make a big step very quickly. The only thing that changed was my belief in tyre capability. Maybe there’s others that come past you in your group with their knee on the deck and reaching lean angles you’re hoping for. If you’re on high end rubber, it’s pretty safe to assume that the tyres are just as capable from a lean angle perspective. As I said, on a well-maintained machine on sporty rubber that’s up to temperature, lean angle itself isn’t really the enemy, and the bike will quite happily sit at high lean all day long if it’s balanced and stable. It’s what you do with the other controls that is likely to cause a break in traction. 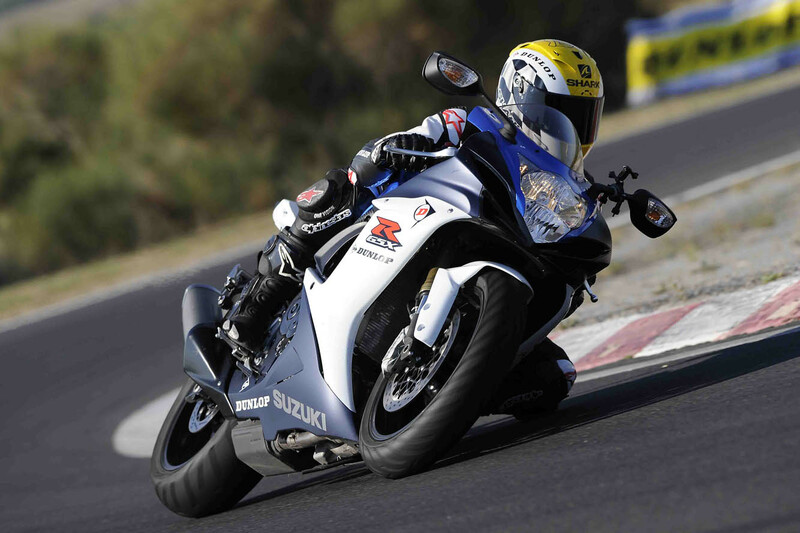 Things like too much brake at high lean, poor throttle control, a death grip on the bars or unnecessary steering inputs. With the perspective that your tyres are well capable of high lean angles, then all you have to do is trust that your technique is fundamentally correct (or somewhere close to it). Another fact in this is that we, as humans, have an embedded intolerance to higher lean angles. Without going too deep into it, basically it’s something that is built into us from many thousands of years standing on two legs and being perpendicular to the ground. That is our natural and comfortable position to be in, both visually and how we balance ourselves as we move around. Added to that is our extensive experience of running on natural surfaces, where it can be observed that our natural leaning limit is around 20 degrees. It’s 20 degrees because it’s at that point where the quality of traction we get on these natural surfaces begins to diminish. So much so that it becomes a big concern for us. 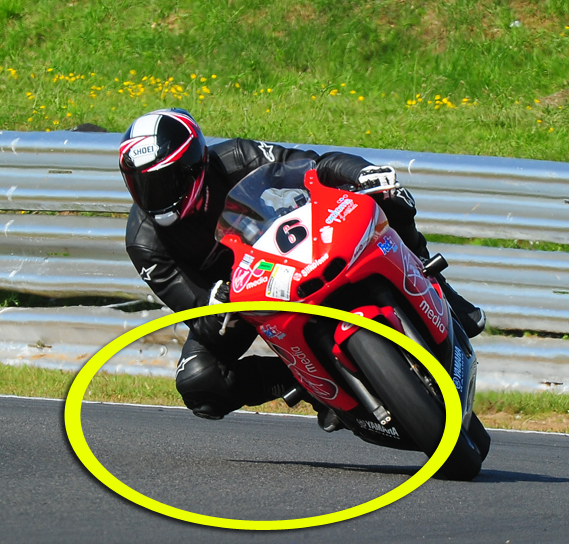 When we throw our leg over a bike for the first time, this instinct remains with us and translates straight into our fears of tyre traction at higher lean angles. As you push past that natural leaning limit, all of the above comes together to create strange sensations and often resistance to lean angle. A resistance to lean the bike itself, but also a resistance to lean the body over too. This is something that can only really be overcome with experience of higher lean angles, but just knowing this could be a factor in your resistance may help you better pinpoint where your issue is coming from. Another reason why riders struggle is because they have a poor perception of lean, meaning they feel they’re leaning over a large amount when really they’re not. Because of this poor perception it leaves riders fearful of leaning the bike more because they worry they’ll lose traction or some part of the bike will touch down. A good way to combat this is to improve your perspective. The best way to get perspective is to look at photos and videos of yourself. If you can see a good deal of space before your knee or foot hits the floor, then you know you still have some way to go. Everything we’ve covered to this point has been dealing with the mental issues behind resistance to lean angle, along with some baked in physical issues too. This is where the vast majority of lean angle resistance will be coming from. Even with that being the case, you still have to get out there and push through the barrier itself in order to truly build greater confidence of higher lean angles. The first step in this is to put yourself in the best position to achieve your goal. Pick a corner you’re most comfortable with and follow the below steps. In my experience medium speed/length corners where a fair amount of braking is needed (but not a lot) are the best corners for keeping this comfortable. Charging into a corner trying to force speed is unlikely going to get you the result you want. Instead I find it best to use more modest braking markers that leave you enough time and attention to focus on what you’re really trying to do – roll more speed into the corner. This means using a braking point and level of braking that easily allows you to roll more speed into the corner, but not braking so late and hard that it moves you into ‘corner attacking’ territory. With a sensible braking point set, now you just need to release the brake lever a little quicker as you approach the corner. With everything else remaining the same this is a sure-fire way to incrementally roll more speed into it. As you move into the corner with an extra helping of speed than you usually have, you’ll need to lean the bike a little more to create a similar line and hit the same apex. As you begin steering and leaning the bike over you may simply push straight past your previous limit and lean the bike more, which is great! However, what is likely to happen is that you’ll once again lean the bike to the angle you know to be safe and hit your existing limit. It’s at this stage that you should TELL yourself to lean the bike more and that it’s safe to do so, then just lightly press on the inside bar to initiate a little more lean, all while remaining off the throttle. When you’ve leaned that little bit more, pick up the throttle and steady your speed to balance the bike. Now, while saying “just lean it more” is so simple, I know it’s tough and I know they’ll often be a lot of frustration around this area, so try not to be too hard on yourself as you work to break this barrier. This struggle is extremely common. Do your best to get as much perspective as you can on the potential your bike and tyres have and how much potential you’re currently using, and with a little patience and conscious practice it shouldn’t be too long before you can break through this barrier.